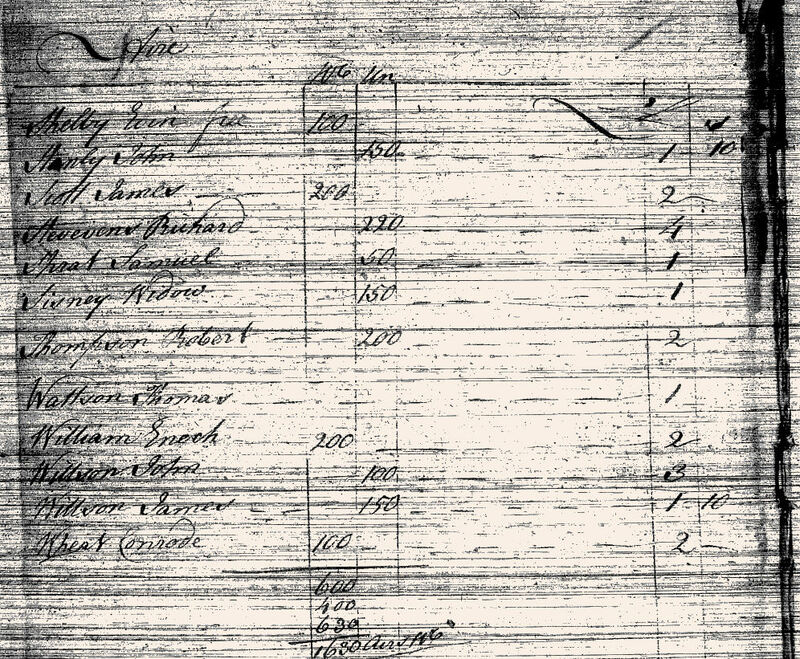 This image includes the top portion of the third page of the original 1762 tax assessment return for Aire Township, within Cumberland County, showing Residents' (interspersed with Non-Residents') names "Shelby" through "Wheat". Note: This image was scanned from a photocopy of the original 1762 tax assessment for Aire Township, within Cumberland County: part of the region that would, in 1771, become Bedford County. This image was obtained from the Cumberland County Historical Society in Carlisle, Pennsylvania. Note that this image, as with all the images for the Cumberland County tax assessment returns, comes from microfilm copies of the original documents. It should also be noted that this image, as with all the images for the Cumberland County tax assessment returns, was derived from the 'office' copy of the return, rather than the 'field' copy. For that reason, it will be noticed that the handwriting is similar throughout all of the returns. The following is a transcription of the names of the Residents which appear on the 1762 Aire Township, Cumberland County tax assessment return, as shown in the image above. It is as accurate as possible. The published American Archives does not include a transcription of this tax assessment return. The earliest tax assessment return for Cumberland County to be included in the Pennsylvania Archives is dated for the year 1778.